You'll be £30.00 closer to your next £10.00 credit when you purchase The Royal Arsenal Railways. What's this? Mark Smithers has written a number of definitive books and magazine features on the history of locomotive construction and the development of narrow gauge railways. This book looks at the history and development of railways at the Royal Arsenal Woolwich, which evolved from humble roots in the 1820s into three separate railway systems, serving the Gun Factory, Laboratory and Carriage Department. The three systems originally had their own fleet of locomotives and rolling stock and were constructed using three different track gauges: standard gauge, 2ft and 18in. The three separate factories and their railways were amalgamated to form one organization on 1 January 1891, when the Royal Arsenal Railways became an official entity. The Arsenal and its railways played a major role in both world wars and continued to hold an important place in gun and propellant manufacture until the late 1950s, when the complex was gradually run down. The Royal Arsenal and its railways were finally closed in 1967, when the last train of material left the site. This book covers the history of the system from its beginnings through to its demise and also details the significant remains of a once mighty network. There is probably little more that could be said about this intriguing system, and this book generally does it justice. Military historians will welcome this book, based in Woolwich by the River Thames. Mark Smithers covers the history of Arsenal lines from an early iron railway in 1825 to their rundown and eventual closure in the 1960's. This is undoubtedly the definitive book on the rail networks, carefully researched and well presented, of interest to military historians, railway modellers and engineers alike. Given that the site and its activities were covered by the Official Secrets Act and Defence of the Realm regulations it is remarkable how much the author has discovered. An impressive history of the rise and fall of the three separate railway systems at the famous (and huge) Royal Arsenal in Woolwich. Detailed text, archive photographs, maps and drawings help to tell the story of the RAR and the major role they played in numerous conflicts. In these days when most narrow gauge subject matter has been covered in one way or another a new and extensive work on a subject hitherto little focused on is a rare pleasure, and so it is with this book from regular NGW contributor Mark Smithers. Anyone who knows Mark Smithers' work will not be surprised that his book goes into great detail about this history of each of the systems and the stock that worked them. Narrow gauge and standard gauge locomotives are each given their own extensive chapters, there are a host of photographs, most of very good quality reproduced to a large size, and four pages of superb full-colour maps of the site. Narrow gauge modellers will find the book particularly useful - as it features great many drawings. There are also some rolling stock drawings, and again all are reproduced to good quality and to a large format. 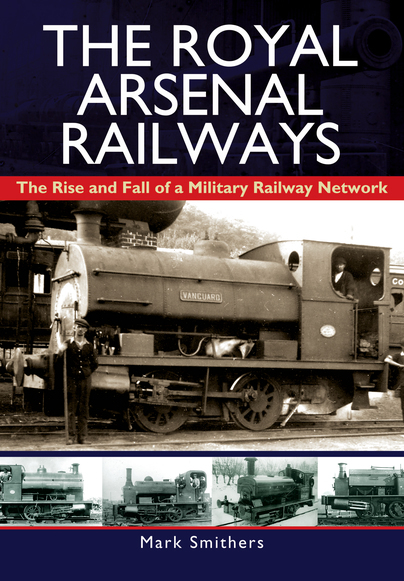 Military narrow gauge is a popular subject at present - but this book throws a large spotlight on an area of the military that many tended to forget. The result is a very interesting, detailed history that comes highly recommended. This is a fascinating book, well printed on good quality paper, with good clear photographs. It will repay careful reading and is thoroughly recommended. Mark Smithers has had a virtual lifelong interest in the history of industrial and narrow gauge railways. In addition to being the author of two previous books on the subject, he has been a contributor to most of the major specialist railway journals over a period spanning three decades. He has also been involved in historical research used in the construction of replica narrow gauge steam locomotives, both in full-size and large-scale model form.